In a recent Reuters “Book Talk,” Bernard Vaughan interviewed actor Martin Sheen on his recent project as narrator for the audio book Beyond Religion: Ethics for a Whole World by the Dalai Lama. 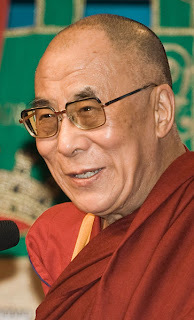 The Dalai Lama (Tenzin Gyatso) is the spiritual leader of Tibet and the purported fourteenth reincarnation of Avalokiteshvara, the Bodhisattva of Compassion and patron saint of Tibet, within the Tibetan Buddhist tradition. He is also the author of The Good Heart: A Buddhist Perspective on the Teachings of Jesus. The Dalai Lama undoubtedly has also a great influence upon many outside Buddhism. A Christian can agree that in a world filled with diverse people with disparate beliefs there still exist common ground ethics for dialog in resolving conflicts. There are indeed moral absolutes that are true for all. Paul writes, “For when Gentiles who do not have the Law do instinctively the things of the Law, these, not having the Law, are a law to themselves in that they show the work of the Law written in their hearts, their conscience bearing witness and their thoughts alternately accusing or defending them on the day when, according to my gospel, God will judge the secrets of men through Christ Jesus” (Rom. 2:14–16). There is then a natural law written upon the heart’s of people, which allows for dialogue on ethics. Christians can also agree to stand up against injustice, and rightly condemn evil done in the name of Christ. Moreover, Christianity, alone among the possible worldviews, has a satisfying explanation for why suffering and evil exist in the world (see, for example, “Addressing the Problem of Evil” by Douglas Groothuis,” and “How Should Christians Approach the Problem of Evil?” by E. Calvin Beisner and Chad Meister). The idea of segregating faith from the public forum still poses a problem for the Christian. It is true that we possesses moral sensibilities; yet, we are much like blind men inside a room with an elephant, groping around, and trying to describe the creature, but only sensing bits and pieces of the whole. We are in need of someone who can see, and say, “You there, you are feeling only its leg, if you keep moving to your left, you will feel the belly, another leg, an ear, and its head, then you will have a better idea of what this animal is like.” Christianity holds that God revealed Himself to mankind through Moses and the prophets in the Old Testament then through Jesus Christ, the very incarnation of God, and the apostles in the New Testament. It is then through divine revelation that people get a better understanding of moral truths. Is living in a diverse world of people with disparate beliefs reason for leaving faith out of conversations on ethics? No! Christ’s followers emerged out of Judaism but they also took their message to the ends of the earth. They went out to share Christ with a world influenced by Caesar cults, Greek philosophies, mystery religions, and magic. The reason is that Christians had a message that could transform people. “For I am not ashamed of the gospel, for it is the power of God for salvation to everyone who believes, to the Jew first and also to the Greek” (Rom. 1:16). Moreover, as the apostles also taught, “Salvation is found in no one else [than Jesus Christ], for there is no other name under heaven given to mankind by which we must be saved” (Acts 4:12). It can also be pointed out that Christianity provides the world with spiritual resources for social transformation. People through deep reflection upon God’s Word came to understand their own dignity as persons created in the image of God both male and female (Gen. 1:26–27), and this was underscored in the reality of the gospel message of how God loved humanity such that He sent the Son to be incarnated—Jesus Christ—to die upon the cross on behalf of sinners so that those whosoever believes can have everlasting life (John 3:16; Rom. 5:8). The Scriptures would also form the basis for values such as the sanctity of life, charity, women’s equality, and slave emancipation. They would also influence development and innovations in art, science, jurisprudence, and economics (for further study, please see The Book that Made Your World by Vishal Mangalwadi and How Christianity Changed the World by Alvin J. Schmidt).